Great to see a more modern interior in reception and followed through to the bedrooms. A very pleasant stay in Honfluer. Great interior in reception and followed through to bedrooms. Value for money. Cosy and comfortable. Very tasty breakfast, in particular the madeleines. We met up with our friends who recommended the hotel. We had a very warm welcome from staff but did find it rather confusing on arrival as we could not see a reception area to sign in. Staff appeared to be sitting in a bar. The room was a good size very clean and quiet. There was a problem with a mis-understanding of payment when a member of staff charged us for the stay when we had pre-paid. This was very professionally dealt with the next day. We will be back. Have visited many times before. Helpful staff, clean comfortable room. Comfortable room, convenient for town. Clean and comfortable room in a convenient location. Quiet at night and easy access and parking. We’ve stayed here many times. But the room we had looks tired and needs some work so we can feel it’s more acceptable. Especially the cost has increased due to it’s popularity. Comfortable, quiet and decent hotel. Friendly staff. Staff were very good location was not and breakfast was poor with no hot food at all. We would have been better booking into the ibis budget with same food and room but at lower cost. Everything fine only during leaving we were at the elevator in front of us somebody of the cleaning staff. Although I have lots of respect for these people, but not a single question like, would you go ahead, nothing ! She slept in with her material and that was it. As customer I felt not so good. A question would be nice, then we could say no its ok , out of Respect for her. We had a warm welcome and for the young child there was a surprise waiting in the room, very nice. We had 2 rooms and both were good. What we very much appreciate is the good beds, after a long drive, you wake up the next day with your body ready for another long drive. The breakfast was well-arranged and the coffee was of a perfect taste (which is certainly not common in many countries). We will come back again. An excellent hotel, staff courteous and very helpful. Well kept hotel 2nd stay here in 2 years. Was just and good as first time. Will stay here again. Excellent service clean bedding and rooms. Great staff and bar facilities. Breakfast as always very good. It was good, it is a while since we have stayed in Honfleur, the bedrooms are an improvement, the bed was very comfortable and the staff are vey helpful and polite. In fact we were going to go out, but we were so comfortable after a 500Km drive we decided to stay in and watch a movie. 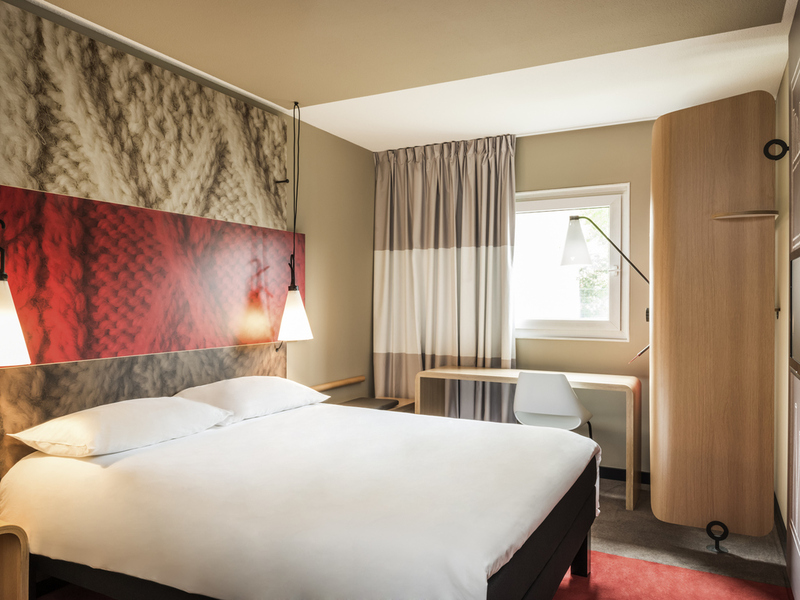 The Ibis Honfleur is everything that you would expect from an Accorhotels Brand, it has a friendly staff, clean, comfortable rooms, excellent parking facilities, and a good Breakfast. It is opposite a good restaurant and within an easy 10 minute walk to the centre of Honfleur. Quiet hotel, good food and easy all day menu. We use this hotel to break our journey from the west of France to Calais. It has good parking, and if you don’t want to go into town they have a fair selection of food. Very efficient young staff. Rooms are immaculately clean and Ibis beds are always comfortable.